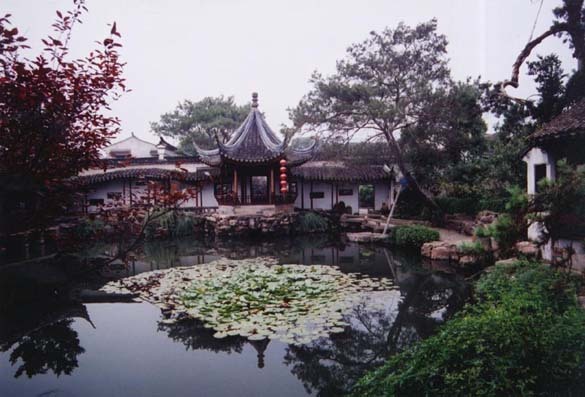 This is one out of four famed Suzhou gardens, and is representative of their artistic characteristics and cultural value. 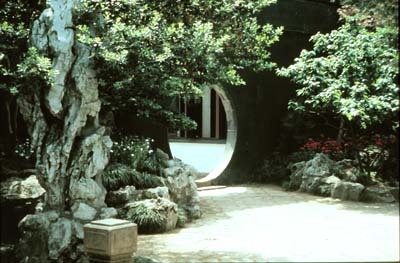 The Master-of-Nets Garden is a typical private garden which combines with a residence. The residential area has three parts; first from the main gate to the sedan chair hall; then the Hall of Scrolls, and finally the Beauty Within Reach Tower. These three sections open up along a middle axis. The Hall of Scrolls is the main hall; a wide room, high under the ceiling, and beautifully decorated. In front of this is a richly encarved door of excellent handicraft-one of its kind in the south-east; an antique piece of high artistic value. The entire residential area is very laid out rigorously and according to rules; not very large, but with rich atmosphere, contrasting the calm and reserve of the garden area. 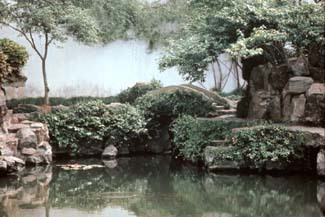 The Master-of-Nets Garden's area is not big; approximately 0.47 hectare (including its residence).It is made up of main and auxiliary parts. The main areas are based on water; each landscape is arranged around water. South of the pond we find such views as the Small Hill and Osmanthus Fragrance Pavilion,the Washing my Ribbon Pavilion over the water, the cloudy Ridge, etc. In the northern area they are the 99 Watching Pines and Appreciating Paintings Studio, the Prunus Mume Pavilion. In the eastern part we find the Duck Shooting Corridor. In the west we find the Moon Comes with Breeze Pavilion. The entire main area is very exact in its proportions; the handling of closed or open space and the enveloping or openness of the gardens' construction make this small garden like a unique poem-of few words; a garden in a garden, a view in a view, giving unforgettable memories. 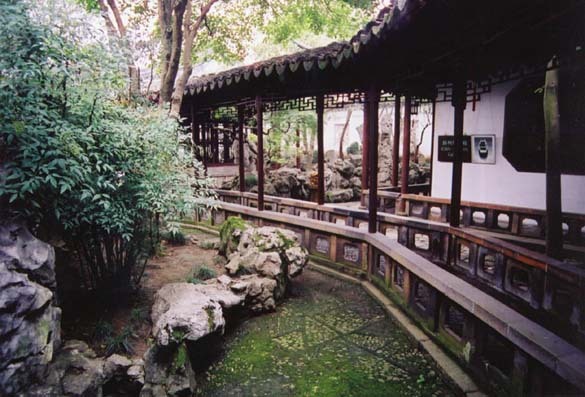 Wang Shi Garden, or Garden of the Master of the Fishing Nets, was originally the garden of the Song official Shi Zhengzhi and bore the name Thousand Scroll Hall. It was rebuilt during the reign of Emperor Qian Long and changed to its present name. 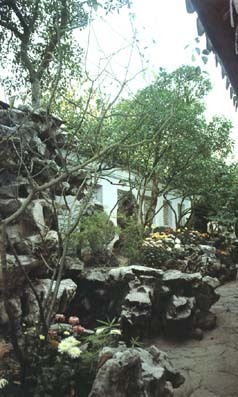 The whole compound is made up of a garden and living quarters. The garden is located in the west, with a lake serving as the central point of the layout. On the lake's shores, corridors, pavilions, stone bridges and rockeries compose a scene of rich attractions. 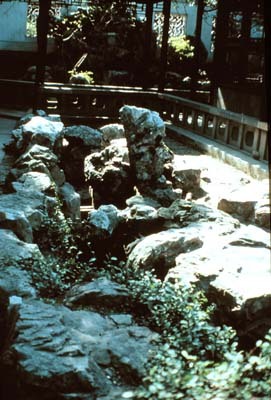 Alongside the lake are picturesque grottos of yellow huangshi granite, in the creation of which techniques derived from Chinese painting were applied. To the north of the lake are such buildings as the Pavilion for Viewing Pines and Enjoying Paintings and the Void Studio (Ji Xu Zhai). Standing tall and short, dense and sparse, these buildings compose a visually fascinating scene along the north shore. 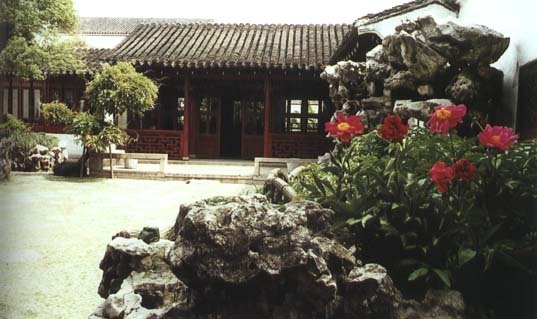 To the west is a quiet petite court with Late Spring Abode (Dian Chun Yi) as its main building. 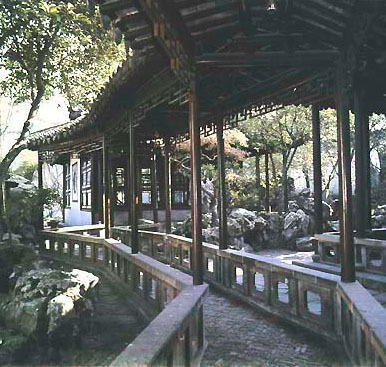 To the south are Small Hill Osmanthus Bush Pavilion, Pavilion of Clean Water for Cap-string Washing, Stick to Peace Mansion and Lute Chamber, comprising courtyards of quiet seclusion. 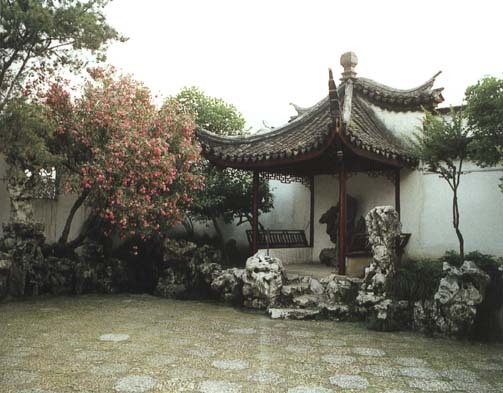 The chief structure is the Small Osmanthus Bush Pavilion which is screened off from the lake by a big rockery. The Master-of-Nets Garden covers 5,400 sq.m. and is divided into two parts: the eastern house and the western garden.Half enclosed by a screen wall with a row of iron rings for tethering horses,and two alleyway side entrances,the front door faces south,having a pair of var. pendula in front ,and hairpin-like door ornaments above ,and two huge blocks of stone carved in the shape of drums kept fast with the hands,placed one by its left side and another by its right side.This type of front door showing owner's rank at the court has become very rare now. On a north-south axis there are four successive buildings separated by garden courts,namely the front door hall, the sedan-chair hall, the grand reception hall and the two-storeyed tower.Constructed in accordance with the strict regulations of feudalism, they are magnificent buildings with extraordinary furnishing and interior decoration. In front of the grand reception hall is a door with richly carved earthen ornamentation.The two-storeyed tower at rear is the place where the family used to stay,and the hall in front is chiefly for reception,public celebrations and ceremonial observances.Every hall has a door or walk-way leading to the garden.It is a typical example of combning living quarters with a landscape garden in Suzhou. The garden lies to the northwest of the house,making up four fifth of the total area.Quite different from the normal architecture in the east,the garden architecture enjoys a considerable degree of free.Varieties of building are laid out to meet the needs of reading,painting,viewing,resting,sipping tea.holding small baquets among scholarly friends,capping verse,performing on a musical instrument,meditating on nature and cultivating one's mind.Roughly speaking ,there are three parts in the garden.The Small Hill and Osmanthus Fragrans Pavilion,the Daohe House and the Music Room constitute the middle distance of the confined southern part of the garden.The technique of emancipation by suppression and contrasting light with shade are remarkably employed to make the middle part of the garden appear more impressive that it is when seen alone. The middle part of the garden has a pond in the center covering about 440 sq.m. with a small bay to the northwest and a streamlet to the southeast giving the impression of infinity. 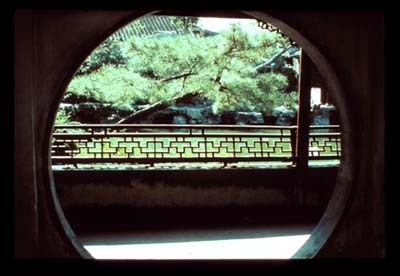 It is curved round by a roofed walkway ,natural-looking mountains made from yellowstones piled up in layers forming hollows and caverns within ,a tiny arch bridge called "the Leading to Quietude",and a number of delicate and well-proportioned pavilions,namely the Washing-My-Ribbon Pavilion over the water,the Moon Comes with Breeze Pavilion,the Prunus Mume Pavilion and the Duck-Shooting Veranda.The Washing-My-Ribbon Pavilion over the water is the best viewing place of the garden. The idea comes from a fishman's song in the works of Mencius,saying ,"If the water of the Canglang River is clean ,I wash the ribbon of my hat ;if the water of the Canglang River is dirty ,I wash my feet." The same is true to the name of the garden---"Master-of -Nets". The northern part of the garden features studies and studios with beautiful garden courts. 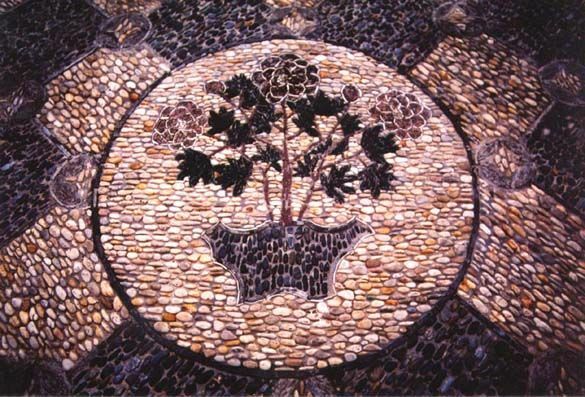 Some noteworthy places include the Peony Study. the Watching Pines and Appreciating Paintings Studio,the Meditation Study, the Five Peaks Library and the Cloud Stairway Room. With white -washed walls as their backdrop ,stones bamboo,Prunus mume and Musa basjoo partly concealed by windows and buildings have incredibly come to foorm numerous picturesque scenes. In sum,there are scenes beyond scenes,and gardens within the garden.Many buildings are perfectly well-spaced intead of being crammed. 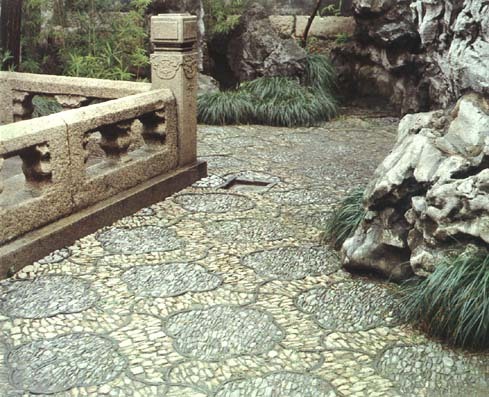 A small area of water and stone is made to seem large.Based on illusion,the garden is full of change,capturing the effect of boundlessness,and achieving a unity of part and whole. The Master-of-Nets Garden serves to illustrate how the few surpasses the many and the small exceeds the large. 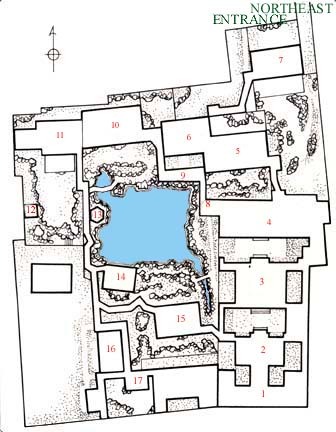 Today the Master-of-Nets Garden has 22 buildings, 2 doors with richly carved earthen ornamentation, 15 plateaux, 9 parallel couplets, 15 brick and stone carvings, 32 stelae, and 8 rare species of old trees, namely Sabina chinensis, Pinus bungeana, etc. *Bus No. 4 from Changmen or Jiejia Bridge on People's Road takes one straight to Wang Shi Yuan. (Fishing Retreat). 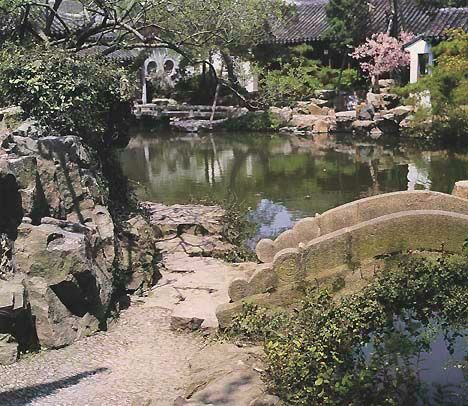 In the years of Emperor Qian Long (1736-1795) of the Qing dynasty, a bureaucrat named Song Zongyuan built a garden on the site after he went into retirement. 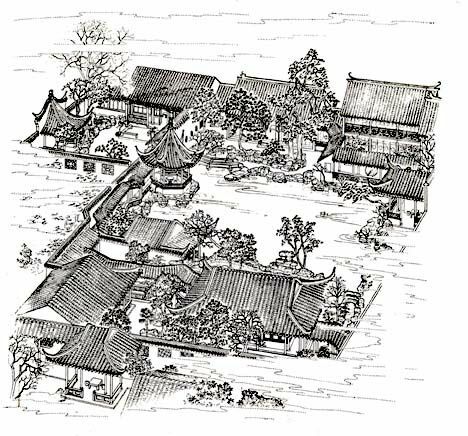 Drawing inspiration from the name Yu Yin, he called the garden Wang Shi Yuan (Garden of the Fisherman) to express his aloofness from politics and material pursuits. Measuring only about half a hectare in area, the garden is compactly laid out, with halls, corridors and pavilions well positioned, living space and gardens closely combined, and every part of the garden joined in an integrated whole. 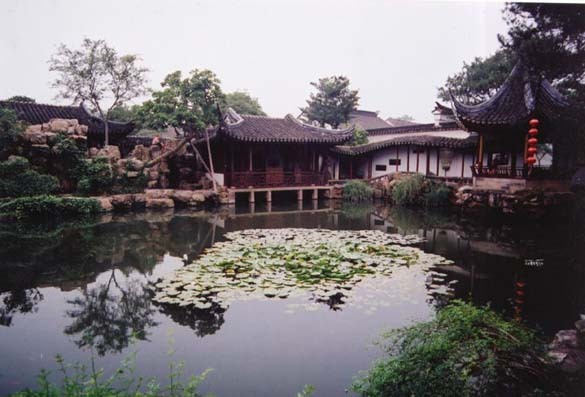 In this respect, Wang Shi Yuan is unique in Suzhou. 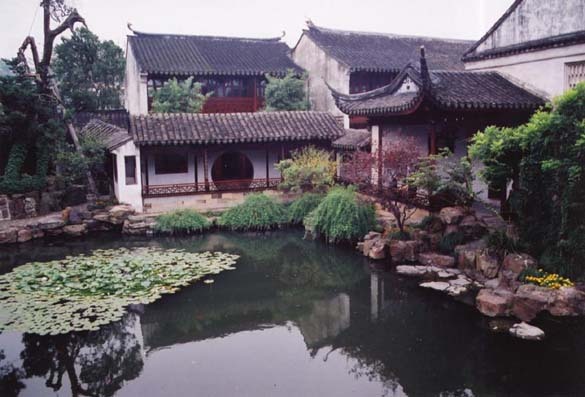 The residential area in the eastern part of the garden is representative of those of the feudal gentry in old Suzhou. From south to north are ranged three elegantly decorated halls - the sedan hall, main hall and rear hall. The six-meter-high gate arch in front of the hall bears an imposing brick relief carving 3.2 meters wide by 2 meters high. In its center are inscribed four characters - "Zao Yao Gao Xiang". "Zao Yao" means literary grace, and "Gao Xiang", flying high. On both sides of the gateway are brick relief carvings depicting scenes from dramas and operas, among them "Guo Ziyi Offers Birthday Presents" and "The Heavenly Official Is Made a Noble". 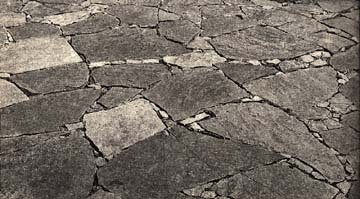 Three characters representing "longevity" are inscribed below. Friezes with lions playing with balls carved on both sides of the gateway are beautifully executed and are imbued with the archaic charm of Chinese folk arts. Built of polished brick, the gateway is inlaid with brass rivets shaped like plum blossoms. This handsome and solid structure ranks foremost among the brick gateways in the classical gardens of Suzhou. A small door west of the sedan hall leads to the middle section, which is the main garden. 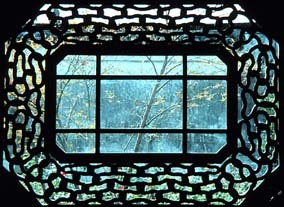 Above the door are inlaid bricks carved with four characters "Wang Shi Xiao Zhu" (The Fisherman's Small Abode). Traversing a corridor, one sees a four-sided building called Xiao Shan Cong Gui Xuan (Hall of Small Mountains and Osmanthus Woods). 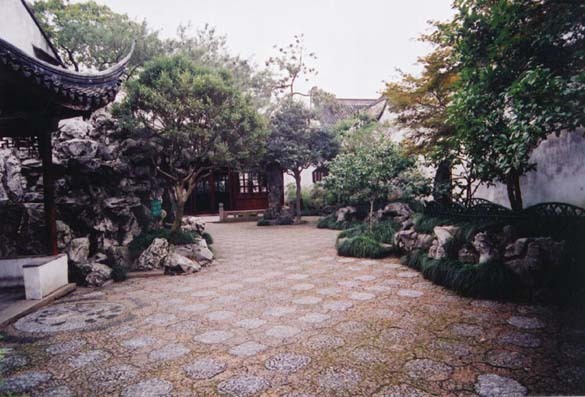 A courtyard south of the hall contains Taihu rocks and a grove of sweet-scented osmanthus. Behind the hall stands a hill built of yellow rocks called Yun Gang (Cloud Ridge). East of the hall lies a stone arch bridge 212 cm long, 29.5 cm wide and seven cm thick. On either side of the bridge are four steps with handrails. 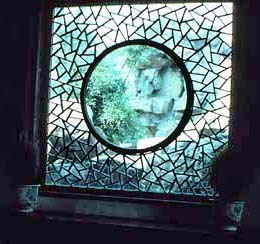 Circular patterns decorate the central facade of the bridge. There is a sluice gate at a distance of 70 centimeters from the bridge. This is the smallest stone arch bridge in the garden. Walking westward along the corridor and then turning south, one comes to the simply but elegantly furnished Tao He Guan (Hall of Tranquility). 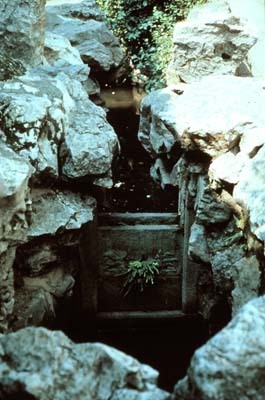 A small door south of the hall opens on a quiet and secluded courtyard, which served as a place for music, as shown by a horizontal tablet with the inscription "Lute Room". 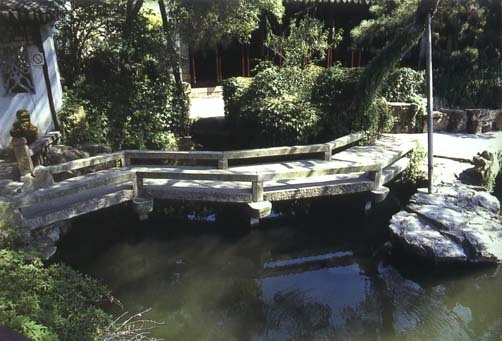 Walking out of Tao He Guan and following the corridor up the hill, one finds Qiao Feng Jing (Place for Gathering Breezes) - a clear pool surrounded by halls, pavilions and corridors. 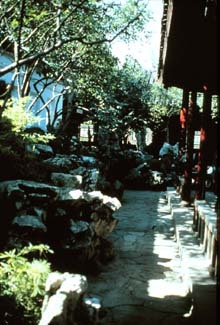 This is the garden's chief scenic area. On its eastern side stands Zhuoying* Waterside Pavilion, an ingenious structure with delicate carvings erected against a cliff and overlooking water. 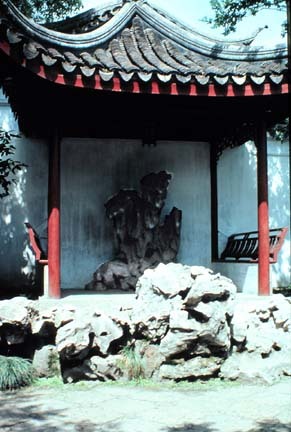 Further along the corridor, the visitor comes to Yue Dao Feng Lai Ting (Pavilion of the Arriving Moon and Wind), perched on a rock beside water. In this quiet scenic area one can indeed enjoy "the moon in the heavens and the wind rippling the water." *The expression "Zhuoying" is from the lyrics of fishermen's songs in Chuci: The Fisherman. Feudal scholars used the expression to denote withdrawal from society and placing oneself above the secular world. Better still is the lone bamboo twig slanting out of the grove. East of this veranda is She Ya Lang (Shooting Duck Corridor) with two delicate brick carvings inlaid in its walls. 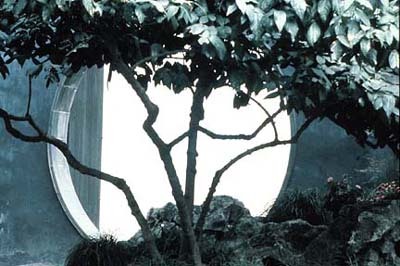 Entering a moon gate, one sees Ji Xu Zhai (House of Concentrated Emptiness), and further east, Wu Feng Shu Shi (Five Peaks Study). 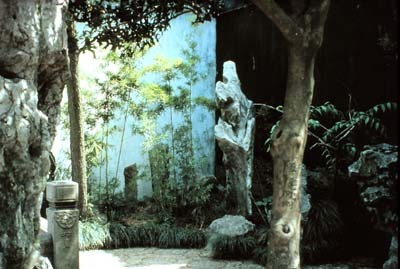 Grotesque rocks are scattered all around the courtyard before the study, and flowers and trees grow in well-ordered luxuriance. A rose was left to accompany the spring breeze. The garden, which used to be called Rose Garden, served its owner as a place of study. 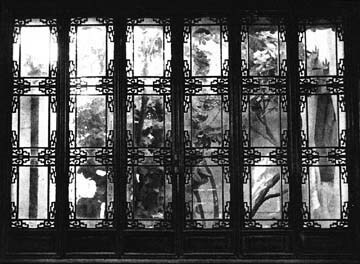 There are three windows in the house which open on lovely scenes of rocks, plum blossoms, bamboo, fish pelargonium and palms. 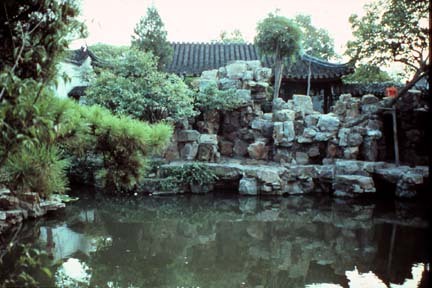 At the southwestern corner of the garden is a spring called Han Bi Quan (Azure-Containing Spring) surmounted by a pavilion named Leng Quan (Cold Spring). A large exquisitely wrought rock stands in the pavilion. 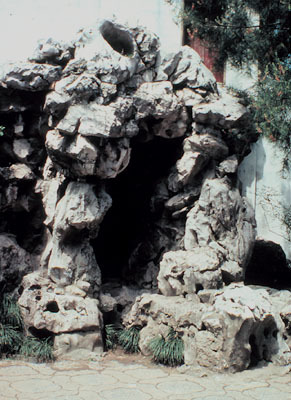 It is said that the rock once embellished the residence of Tang Ying, a famous painter of the Ming dynasty. 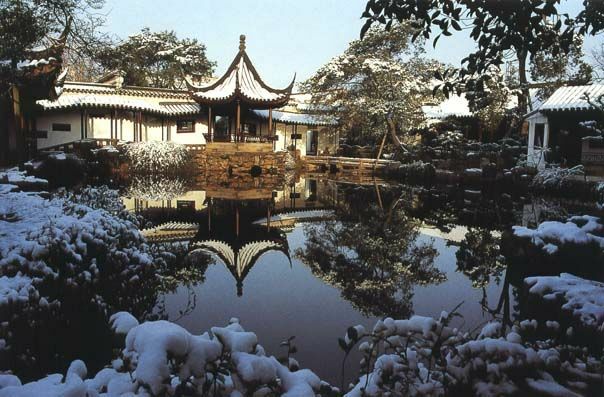 A lovely garden called Ming Xuan, built in the traditional style of Suzhou gardens, is one of the attractions at the Metropolitan Museum in New York. It was modeled on the above-mentioned Dian Chun Yi.